That is the finding of the G-Finder 2018 Report, launched by the Australian-based Policy Cures Research group, which has been tracking such investments for the past decade. The report is widely used by national governments, civil society, industry, countries and the World Health Organization as a means of tracking R& D investments in neglected diseases to identify needs, gaps and barriers to progress. “We wanted to make sure that when we said ‘highest ever’, we really meant it. But we have reviewed thousands of lines of data and we are confident that this is legitimate,” said Anna Doubell, director of research at Policy Cures Research, speaking at the report’s launch in Geneva today. She added that while funding also reached a historic peak in 2009, this year’s even higher level of investment is different — because it reflects a much broader range of funders than ever previously seen. 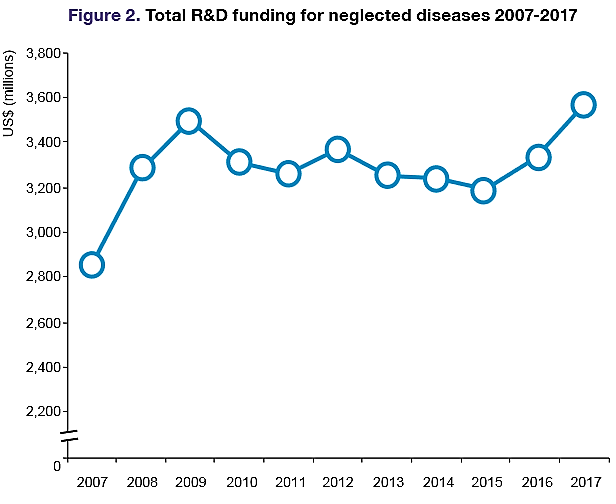 More European countries as well as key emerging economies such as India and South Africa are making their mark– even though the US remains the largest single investor in neglected disease R&D. “This year it’s a totally different story [from 2009],” Doubell said. While investments by the pharma industry was down slightly, public funding rose, driving the record overall increase. The largest increases were chalked up by the United Kingdom and the European Commission, India and Germany, the report noted. Non-governmental funders such as Unitaid, Médecins Sans Frontières and Gavi also increased funding in neglected diseases. “India led the charge amongst the LMIC (lower and middle income) countries,” said Doubell, noting that their total amount of public funding for neglected disease R&D was above that of either Germany or France. South Africa also performed well “when you look at its contribution as a proportion of GDP,” she added. Yet not a single country in 2017 has yet met the recommendation of the WHO Global Strategy and Plan of Action on Public Health, Innovation and Intellectual Property calling for WHO member states to dedicate at least .01% of their GDP to research into the health needs of developing countries, the report states. And public and philanthropic funding is still too reliant upon a handful of top funders. Still, overall trends represent “a more balanced picture” said Ilona Kickbusch, director of the Global Health Centre at the Graduate Institute of International and Development Studies, who moderated a panel of experts at the launch event. “There is greater European representation and increase responsibility of the BRICS [emerging economy] countries,” Kickbusch said. While industry investment is slightly lower than 2016, Doubell noted that this comes “after five years of consecutive growth, so I don’t think this means we need to be ringing the alarm bells.” Notably, 2018 saw regulatory approvals for three new drugs for neglected diseases – including sleeping sickness, onchocerciasis and P vivax malaria, involving public-private collaborations of various kinds. Doubell predicted the investment would rebound as more early stage drug candidates in the pipeline advance to clinical trials. Williams emphasised the need to be creative in designing clinical trials – so that getting drugs to approval and, past approval, to markets, is faster and easier. “We need to build trials that are faster, cheaper and more effective,” she said. While achievements cited by the report can be ‘celebrated’, the deep funding gaps remaining for some neglected diseases shouldn’t be ignored either, other panellists noted. Most investments remain focused on HIV/AIDS, TB and malaria, while funding for other neglected diseases has remained relatively steady or even declined, noted Soumya Swaminathan, deputy director of programmes at the World Health Organization, and previously director-general of the Indian Council of Medical Research (ICMR). “There is an overall increase in funding for the ‘Big Three’ .. and some great success stories. But there is not enough for other [diseases], and some have even seen a decrease,” Swaminathan said in a keynote address. Another neglected disease mycetoma, an inflammatory condition usually affecting the feet tissue of poor populations walking barefoot, isn’t even mentioned in reports such as G-Finder, because it is hardly funded, Swaminathan noted. The Khartoum-based Mycetoma Research Centre, is one of the sole institutions investigating the disease, although DNDi also has recently supported a search for new treatments. Assessing R&D funding through an “equity lens” can help ensure that, in the spirit of the SDGs, there is “no one left behind,” from diseases such as mycetoma and trachoma, she said. At the same time, funding is not the only barrier. Other challenges include: developing products adapted to the real needs of people; moving research evidence into actual policy decisions; and ensuring that communities can really get access to new drugs and diagnostics that make a difference in their lives.